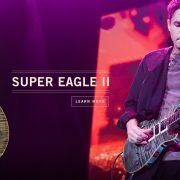 It’s no secret that John Mayer’s main guitar on tour with Dead & Company has been the PRS Super Eagle, launched last spring. During the 2016 tour, PRS made Mayer a second version of that instrument with some updated woods and aesthetic appointments. Mayer played the Super Eagle II on the very last show of the 2016 tour and is continuing to play it for Dead & Company’s 2017 summer tour. PRS and Mayer are excited to offer this new version, the Super Eagle II, to fans and collectors. Some of the specifications Mayer and Smith collaborated on for this special run of instruments include a longer (for PRS) scale length of 25.375”, specially-wound 58/15 JM treble and bass pickups with a specially-wound Narrowfield JM pickup in the middle position (with three individual coil-tap mini-switches), a JCF Audio preamp with treble boost, as well as a hand-signed sticker in the f-hole of the guitar that was designed by Mayer’s friend David Smith (who also designed the cover art for Mayer’s 2012 “Born and Raised” album). The pickups deliver a bright, clear tone that has been heard in venues across the USA in Mayer’s recent performances with Dead & Company. The Private Stock Super Eagle II will be limited to 120 instruments.